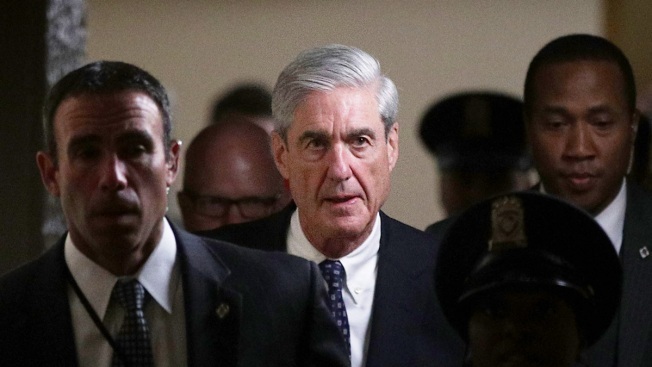 In this June 21, 2017, file photo, special counsel Robert Mueller (2nd L) leaves after a closed meeting with members of the Senate Judiciary Committee at the Capitol in Washington, DC. The committee meets with Mueller to discuss the firing of former FBI Director James Comey. Deputy Attorney General Rod Rosenstein explicitly authorized the Justice Department's special counsel to investigate allegations that President Donald Trump's former campaign chairman colluded with the Russian government, according to a court filing. Special counsel Robert Mueller's team of prosecutors included that detail in a memo defending the scope of their investigation, which so far has resulted in criminal charges against 19 people and three Russian companies. Paul Manafort, who led Trump's Republican campaign for several months in 2016, has challenged Mueller's authority and asked a judge to dismiss an indictment charging him with crimes including money laundering conspiracy and false statements. He said Mueller, who was assigned to investigate potential coordination between Russia and the Trump campaign, overstepped his bounds by charging him for conduct that occurred years before the 2016 presidential election. But in their new filing late Monday, prosecutors revealed that Rosenstein — who appointed Mueller — wrote a memo last August that outlined the scope of Mueller's appointment. John Dowd, the head lawyer for President Donald Trump in the special counsel's investigation, has resigned. The memo, which had not previously been released publicly and remains redacted in parts, said Mueller was empowered to investigate allegations that Manafort "committed a crime or crimes by colluding with Russian government officials" to interfere with the presidential election. None of the charges Manafort faces alleges coordination with the Kremlin, and Manafort's attorneys had used that point to argue that Mueller had exceeded his authority by bringing charges against him accusing him of various financial crimes and acting as an unregistered foreign agent on behalf of Ukrainian interests. But Monday's filing appears to undercut that argument. In addition to authorizing the Russia collusion investigation of Manafort, Rosenstein also specifically authorized Mueller to investigate any crimes related to payments Manafort received from the Ukrainian government during the tenure of former Ukrainian President Viktor Yanukovych. The description largely outlines the charges against Manafort, which mostly relate to allegations that he conspired to launder tens of millions of dollars he received from his Ukrainian political consulting including his work on Yanukovych's behalf. Manafort has pleaded not guilty and denied any wrongdoing related to Russian election interference. Prosecutors say in their court filing that given their mandate to investigate links between Trump associates and Russia, it was logical and appropriate to investigate Manafort for ties to Russia-backed politicians and oligarchs. "It would also naturally look into any interactions they may have had before and during the campaign to plumb motives and opportunities to coordinate and to expose possible channels for surreptitious communications. And prosecutors would naturally follow the money trail from Manafort's Ukrainian consulting activities," they wrote. 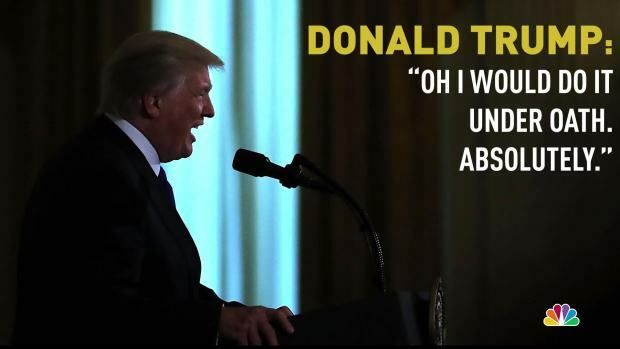 President Donald Trump told reporters he would be willing to be interviewed under oath by Special Counsel Robert Mueller in the ongoing Russia probe.